THE “EMPIRE BUILDER”, one of the crack expresses of the Great Northern Railway of America. The train operates between St. Paul and Seattle. 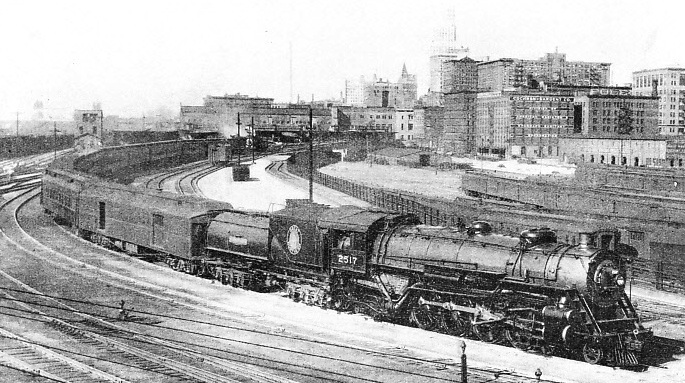 This illustration shows the celebrated “flyer” leaving the Union Station yards at St. Paul, Minn. THE building of the first railway across the United States of America provided some of the most dramatic episodes in the history of that country. The story of this line, the Union Pacific Railway, is indissolubly bound up with the traditional elements of the “Wild West” - Indians on the war-path, “tough” men of all nations in the construction gangs, mushroom cities sprung up overnight, saloons, dance halls, gambling hells, and gun-play. More than a century ago men had dreamed of a great highway right across the continent of North America. In the year 1803, the vast tract of French territory, known as Louisiana, lying between the Mississippi River and the giant mountain range of the Sierra Nevadas, was sold by Napoleon Bonaparte to the Eastern States of America. After this “Louisiana Purchase” the idea of the transcontinental route took a firm hold on the American mind and several expeditions were organized, beginning with John Jacob Astor’s venture across the continent in 1810. The Astor expedition and many later enterprises followed the courses of the great American rivers, and the hardships and distances involved further strengthened the conviction that a direct overland route was essential. The famous “South Pass” across the Rocky Mountains was discovered by the pioneers Ashley and Provost in the winter of 1823-4, and this route attracted the construction engineers of the Union Pacific Railroad in later years. After the settlement of the Oregon boundary dispute with Canada, the acquisition of California from Mexico in 1848, the Mormon settlement of Utah, and the discovery of gold on the western seaboard, the need for rapid transport from east to west could no longer be denied. After much preliminary discussion and many surveys, a Bill was submitted by S. A. Douglas to Congress in 1855, proposing three routes to the Pacific coast. 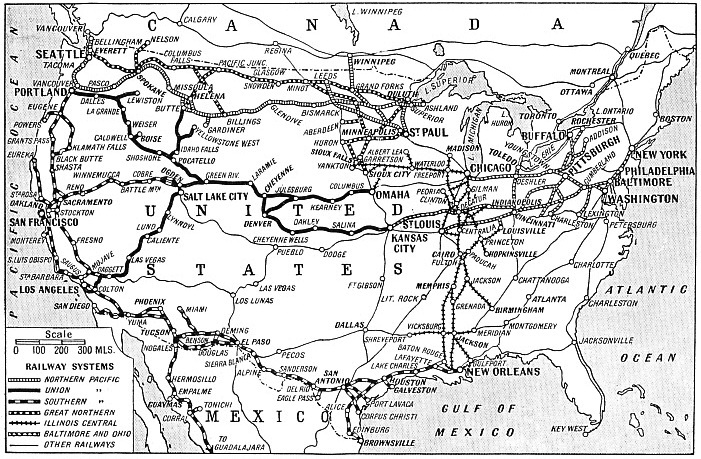 Of the proposed routes, one was to be via El Paso and the Colorado River - to be called “The Southern Pacific”. Another from the Iowa border was to be called the “Central Pacific”, and a third to the north was to be the “Northern Pacific”. The descriptions of these three routes now survive as titles of the three trunk lines first built. The Douglas Bill was not approved by Congress, but with the coming of the Civil War matters were expedited by the passing of an Act creating the Union Pacific Railroad Company on July 1, 1862. IN THE EARLY DAYS of the Union Pacific Railroad. This photograph is of a replica of a Union Pacific train in the middle ‘sixties. The wooden coaches had especially narrow windows so as to offer as small as possible a target to Indian arrows and bullets. Each train carried a community stove, where cooking was done. Bedding, if any, was owned by the passengers. The Act authorized the construction of a railway from the Missouri River to the Pacific coast. The building of the line was to be undertaken by two companies. The Union Pacific Railway was to advance westward from the Missouri and the Central Pacific eastwards from the Pacific coast. The two railheads were to meet and be connected on the California-Nevada boundary. It was recognized that the task of building a railway across the continent was beyond the powers of private enterprise, and grants of land and money were made. A strip of territory through public lands 400 ft wide was granted for the permanent way. In addition to this, the Government gave to the railway company land to the extent of 3,200 acres, with a radius of ten miles on either side of the line, for every mile of track. Financial assistance took the form of bonds, payable in gold, to the amount of £3,200 per mile except for 300 miles through the Rocky Mountains and the Range of the Sierras, where the subsidy was increased to £9,600 per mile. It was stipulated that if the Missouri River was not in railway communication with the head of navigation on the Sacramento River by July 1, 1879, then the whole of the completed portion of the line, together with all rolling stock, material, buildings, and land were to be forfeited to the United States Government. The 1862 Act also decreed that the gauge, route, and starting point on the Missouri River were to be decided by the President of the USA. It was decided that the gauge, maximum curvature, and gradient were to be the same as on the Baltimore and Ohio Railway. Although the essential details of the scheme were completed without difficulty, serious delay arose in connexion with the question of gauge. 5 ft gauge of their own. President Lincoln was in due course asked to determine the gauge, and he chose the 5 ft for both eastern and western sections of the line. Such a decision naturally led to opposition from the Eastern States, where an overwhelming preponderance of mileage was of standard gauge. Finally the matter was settled by Congress, and a Bill, passed on March 2, 1863, fixed the gauge for both lines and for all branches at the 4 ft 8½-in standard. Another difficulty encountered by the railway company was the choice of a starting point on the Missouri River. The President of the United States was entitled to settle this matter, and he selected a terminal on the east bank of the river, known as Council Bluffs, opposite the present city of Omaha. The Chief Engineer of the company, however, had a strong preference for a site seven miles to the south, but finally the people of Omaha had their way and the construction of the line was begun on December 2, 1863. In that year, however, the American Civil War was raging, and little work was done on the Union Pacific Railway until the spring of 1865. Despite the war, however, construction was carried on, but in conditions of great difficulty. Labour was naturally scarce, as nearly every able-bodied man was serving in the armies of the Northern or Southern States. All supplies for the railway had to be brought from Des Moines, 140 miles away; from Boonville, another distant railway terminus; or by a circuitous river route available in the summer months only. LOCOMOTIVE “C.P. HUNTINGTON” was the third placed in service by the Central Pacific (now Southern Pacific), and was named after the first vice-president of the railroad. In later years it was given the designation No. 1 in the books of the Southern Pacific. Similarly to all the early locomotives of the first transcontinental railroad, it was shipped around Cape Horn and assembled at Sacramento, Cal. The maiden trip was made in that city in April, 1864. The engine is 32 ft long, weighs about 18 tons loaded, and has a tractive effort of 3,510 lb. 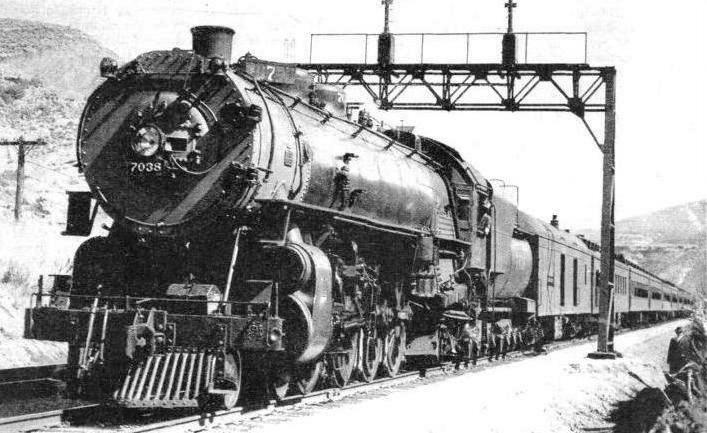 Modern Southern Pacific engines are thirty times as powerful, and a modern Southern Pacific tender is longer than the entire engine of the ‘sixties. The route of the Union Pacific lay through country devoid of constructional material except ballast for the track. Some six and a quarter million sleepers, or ties, were required, and these had to be felled and cut in the forests of Pennsylvania, Michigan, or in the South, hundreds of miles away from the railway. In addition, over 350,000 tons of steel rails and of steel for other purposes were needed. This material had to be hauled overland, at tremendous cost, by oxen. The supply of men and materials was not the only difficulty encountered. Money was scarce and private investors were reluctant to advance financial support for building purposes. Eventually the Government was compelled to assist by doubling the land grant, by permitting the railway company to issue first mortgage bonds, and by agreeing to forgo its rights of a first charge on the property. The Government also enforced the surrender of a strip of ground, 200 ft wide, for the right-of-way through lands under private ownership. J. E. House as Engineer in charge of the construction work. The line was run by House through the Platte Valley, and the survey was so brilliantly accomplished that it has never been necessary to make any material alterations in the alinement. This portion of the line remains as one of the most perfect stretches of the Union Pacific system, and it has been double-tracked. The building of the railway across the plains proved one of the most thrilling dramas enacted on the American, or on any continent. In the early ‘sixties the “Wild West” lived fully up to its reputation, and more than one novelist has laid his scenes among the railhead camps of the construction gangs and the vast open spaces on the prairies. Practically every yard of the way across the plains was challenged in no uncertain manner by the Indians, left in supreme control of vast territories after the Civil War. The construction gangs found their labours interrupted and enlivened by many a sanguinary encounter with warring Indian tribes, such as the Pawnees, Sioux, and Arapahoes, and, farther west, the Crows, Black feet, Barnocks, and Shoshones. So serious did the menace become to both settlers and railway builders that eight military forts had to be established, some of which are still in existence. Mile after mile of the track was laid under the rifle fire of warriors on the warpath. Platelayers and construction engineers again and again would be compelled to drop pick and shovel for revolver and repeating rifle. The encircling tactics of the red men, clinging to the off-sides of their swift ponies and firing across their saddles, were met by the rapid rifle fire of resolute men ensconced behind the rails and massive wheels of the construction wagons. Many famous pioneers took part in the struggle against the warring Indians. Major North, a well-known frontiersman, raised a company of friendly Indians among the Pawnees, and fought many a pitched battle against the hostile braves. SOME OF THE PRINCIPAL SYSTEMS of the United States of America are indicated on the above map, which shows their main lines. The Union Pacific operates 3,768 miles of track, the Southern Pacific 8,791, the Northern Pacific 6,736, the Great Northern 8,328, the Illinois Central 6,857, and the Baltimore and Ohio 6,440 miles. Guerrilla war was carried on for a long time until the railhead had drawn away from the plains to the foothills of the Rockies. Finally peace was concluded between the Indian chiefs and the President of the United States in person, and the railway work proceeded without molestation. Gun play, however, was not confined to the breaking of Indian attacks. The temporary headquarters of the construction gangs became timber-built towns that sprang up, mushroom fashion, overnight. Pay days, with most of the time between, saw these lawless towns given over to drinking, gambling, and gun-fighting. The saloon, faro bank, and dance hall experienced an astonishing boom, and shootings were so common that they attracted little or no attention. North Platte, Sidney, Cheyenne, Laramie, Barton, Green River, and Bear River City successively became the Union Pacific railheads. All provided the pastimes expected of them in the early ‘sixties. Now they are law-abiding and prosperous towns of the United States. For a long time, however, even after the completion of the railway, lawlessness reigned in the western towns. These became the meeting places of the cowboys driving immense herds of cattle from the south-west to Nebraska and Wyoming. For a time, too, the buffalo continued to roam the plains in great numbers, and trains were often delayed for hours when a herd crossed the tracks. Such an incident is depicted on page 84 of this work. The difficulties of the Central Pacific line were of a more geographical character. Under the driving influence of Theodore D. Judah and his associates, prominent San Francisco tradesmen who afterwards became millionaires, the Central Pacific track was pushed forward up the western slopes of the Sierras. Water courses were followed, steep precipices were skirted, and the summit of the range was gained at a height of over 7,000 ft. Down the eastern slopes the line was laid through deep canyons, and thence across the desert stretches of Nevada towards Salt Lake. The building of the Union Pacific was carried on in the face of all difficulties by General Grenville M. Dodge and his assistant, Dr. Durant. Two other men whose efforts did so much to further the construction of the United States first railway were the brothers Oliver and Oakes Ames. The brothers invested more than a million dollars of their own money in the railroad. Oakes Ames was intimately associated with the construction work of the line from August 16, 1867, when the track had been carried to a point 247 miles beyond Omaha. With such skill and vigour did Ames attack his task that in 633 days he had added another 839 miles of track to the railway - an average of one and a quarter miles a day. In the year 1868 Ames built 425 miles of line. With the Central Pacific track steadily pushing eastward and the Union Pacific Railway progressing to the west, it ultimately became necessary for the two systems to be linked up. The original charter granted to the Union Pacific Railway defined the eastern boundary of California as the point to which the line was to be carried for union with the Central Pacific line. This arrangement was subsequently modified, and the Central Pacific was permitted to continue its advance eastwards to meet the Union Pacific. The Central company resolved to carry the track to Salt Lake City, earning as much of the land grant and subsidy as possible. The two advancing railheads met in Western Utah during the winter of 1869. But they did not stop and link up. The construction gangs passed one another and continued to lay parallel tracks. For week after week the railheads receded rapidly, leaving a double set of metals side by side across the prairie. The situation was not without an element of humour, but obviously a halt had to be called, and finally an agreement was reached between the two companies. The Union Pacific track had reached a point 225 miles beyond the meeting-place with the Central Company’s line, and fifty miles of this distance was sold to the latter company. The remainder of the surplus track was abandoned. AMERICA’S FIRST TRANSCONTINENTAL RAILWAY. This picture shows the celebration of the linking of the Union and Central Pacific Railways. Through connexion was established in 1869 between the Missouri River and the Pacific coast. Through communication was effected between the Missouri River and the Pacific coast on May 10, 1869. 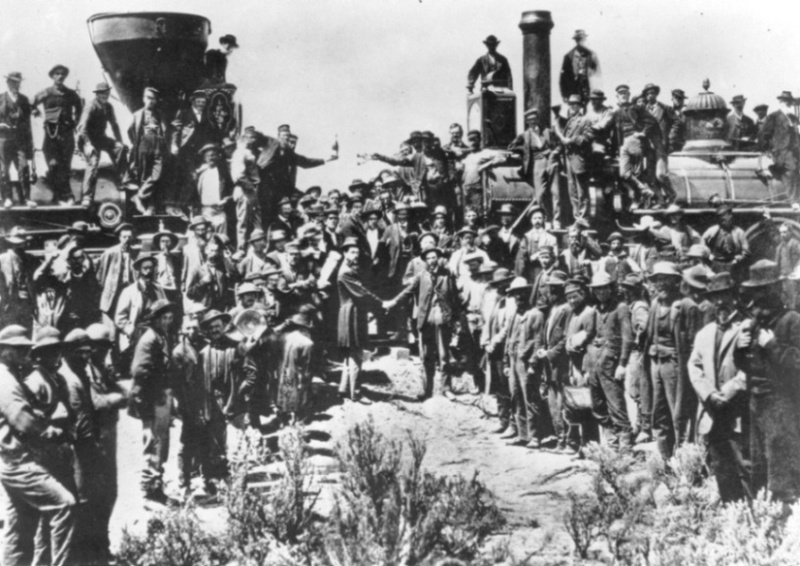 The driving of the last spike joining the Union Pacific to the Central Pacific railroad ranks as one of the most important events in the whole history of the United States. This great task was accomplished in three years, six months, and ten days. From that time the railroads of America were expanded in every direction, branch lines were built to distant districts, and a steady improvement in operation in locomotives, rolling stock, and equipment was begun. This has continued progressively ever since. A number of smaller railways serving the district along the route of the Union Pacific line were in due course incorporated with the larger company. One of these railways was the Levenworth, Pawnee and Western, which was begun in the year 1855. In 1880 this line was incorporated with the Union Pacific. At the same time the Denver Pacific line was added to the great transcontinental railway. On the main line of the Union Pacific a number of important works were carried out. Chief among these was the great bridge over the Missouri River, enabling the railway to cross to the city of Omaha. The building of this bridge was entrusted to General Dodge, who prepared the plans. The company was authorized to issue bonds to the extent of £500,000 and, although a preliminary contract was entered into in 1868, involving a cost of nearly £218,000, work was suspended for a few months, and a second contract for an improved bridge was drawn up, with a figure of £350,000 as the price of construction. The bridge consisted of eleven spans, each of 250 ft, on which the track was laid at a height of 60 ft above high water. During the night of August 4-5, 1877, the eastern end of the structure was wrecked by a cyclone, but was repaired temporarily and served until 1886. Then a new bridge was built, with a length of 1,750 ft and a width of 56 ft 3-in. By 1870 the Union Pacific owned some 150 engines and about 2,500 coaches and wagons. After a period of forty years the rolling stock had increased to 660 locomotives and over 16,550 wagons and coaches of all types. The incorporation in the parent Union Pacific Company of a number of subsidiary lines had resulted in financial loss, and on October 13, 1893, the company placed its affairs in the hands of a receiver for the purpose of complete reconstruction. On January 1, 1897, the present Union Pacific Railway Company was formed to purchase and operate the railways under the jurisdiction of the former concern. This enormous sale of interests, the biggest auction on record, was held in front of the Goods Station of Omaha on November 1, 1897, and the price paid by the new corporation was over eleven and a half million pounds. Some of the most striking improvements on the Union Pacific system were begun in 1899. Double-tracking was carried out extensively, and iron bridges which had served until that time were pulled down and replaced by enormous structures of steel. In 1904 Edward H. Harriman became President of the Company, and he immediately instituted a vigorous policy of reconstruction. Millions of dollars were spent on improvements destined to render this great overland highway one of the most imposing on the continent of America, and in the world. An interesting link with the early days of the railway was provided by the completion of the “Lane cut-off”, near the Missouri River, suggested by Mr. Dey half a century earlier. This cut-off was a new stretch of line, twelve miles in length, which saved a total of nine miles out of twenty-one by the old route. IN ECHO CANYON, UTAH. The “Los Angeles Limited” express, operating daily on the Union Pacific system between Chicago and Los Angeles. The train includes observation car, lounge car, and standard Pullmans, with a choice of drawing-room, compartment or individual berths. Enormous construction works were necessitated in the building of the line, as wide valleys had to be spanned, and long, deep cuttings were involved through hills and high ground. Some of the embankments were of huge dimensions, and among the cuttings was one 85 ft deep, 437 ft wide, and no less than 5,300 ft in length. It is said that in the building of this twelve miles of route over four million cubic yards of earth had to be shifted, and the total cost was more than £600,000. The reorganization of the great railway workshops at Omaha and the installation of automatic signalling along 1,250 miles of main line cost together nearly another million pounds. An interesting point in connexion with the ballasting of the new track was the use of a special gravel found in the vicinity containing an appreciable percentage of gold. It is said that this Sherman gravel, as it is called, would yield, if treated, about eight shillings in gold for every ton of the material. Possibly the most spectacular achievement in the reconstruction of the line was the building of what is known as the “Lucin cut-off”. This stretch of line, after leaving Ogden, goes straight across Utah’s great Salt Lake. The Central Pacific system, after reaching Lucin, in Utah, originally swung off to the north-east round the upper or northern end of this sheet of water. Salt Lake is so saturated with mineral that it is impossible for a bather to sink in it. The Union Pacific’s track on its way westward to Ogden, on the eastern shore of the remarkable lake, also swung northwards towards the original meeting place of the two systems at Promontory. Unfortunately a mountain range runs right down to the water’s edge on the northern shore, so that to negotiate Prom-ontory Point it was necessary to raise the line to a height of 4,907 ft.
On both sides of Promontory Point, also, the grade was of a switchback character. The 147½ miles between Ogden and Lucin were negotiated by powerful locomotives placed at the head of the trains and assisted by others at the rear and in the centre. The cost of hauling traffic over this section of the line soon began to mount up. Finally the engineers suggested that, as the Salt Lake was only thirty miles wide, in a straight line between Ogden and Lucin, and with a depth of only 30 ft, it would be possible to build an enormous bridge right across it to carry the track. This plan had been proposed long before Mr. Harriman’s presidency, but under his guidance it was brought into operation in an improved form. The original scheme involved the use of timber trestles for practically the whole distance over the water; but finally it was decided to reduce the extent of open woodwork to twelve miles, filling in the trestles of the remaining distance with earth to form a solid embankment. The rail level is 17 ft above the water, and the top of the embankment 16 ft wide. To secure the enormous amount of timber necessary for the undertaking large tracts of forest were purchased in Louisiana, Texas, Oregon, and California for the supply of logs ranging from 100 to 150 ft in length. Huge steam shovels played their part in preparing the earthwork, and a stern-wheel steamboat called “Promontory” was built and floated on to the lake to tow lighters, barges, and other craft from point to point, with supplies and provisions for the construction camps. Work continued both by day and by night, the necessary illumination being provided by powerful electric lamps. Over 3,000 workmen were engaged on the task, and at times over 400 car loads of ballast were sent seawards during the daytime. Supplies of fresh water presented another problem, as every drop had to be hauled over a hundred miles of desert. This was a tremendous task, as the daily supply amounted to 336,000 gallons of fresh water. 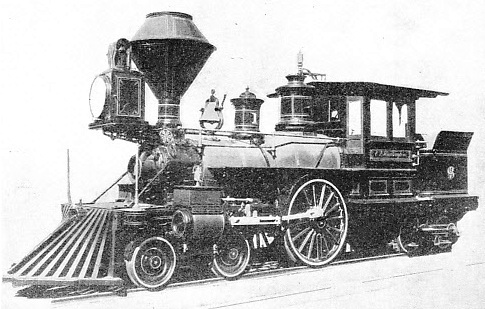 ON THE SOUTHERN PACIFIC, a three-cylinder locomotive of the 4-10-2 wheel arrangement. The first of this class was introduced in 1925 and was designed for heavy freight and passenger service in mountain territory. The locomotive, with booster, has a tractive effort of 96,530 lb. The length of engine and tender is 101 ft 2-in. The two outside cylinders measure 25 by 32-in, and the inside cylinder is 25 by 28-in. Huge pile-drivers were used to force the massive timber baulks into the bed of the lake. So efficient was their work that it was possible, upon occasion, to advance the building of the trestle by 1,130 ft a day. The trestle is of substantial construction. At intervals of 15 ft, five piles are driven in a row transversely to the track. Just above water level a horizontal member, 8-in thick, is bolted to them, with another baulk at the top, the latter being 18 ft long by 12-in square, while diagonal members, 4-in thick, are secured to hold the whole “bent”, as it is called, firmly and rigidly, so that the piles cannot splay outwards under the superimposed weight. Each “bent” is connected to its fellow on either side by eleven heavy baulks laid parallel to the track. The road-bed comp-rises a coat of asphalt laid upon the stringers or longitudinal timbers, with a superimposed layer of rock ballast 12-in in thickness supporting the sleepers and rails. By the time the two arms of the highway met in mid-lake 38,256 piles had been used, and forest two miles square had been transplanted in Great Salt Lake. At the present time the Union Pacific Railroad owns 3,768 miles, all on the standard gauge of 4 ft 8½-in. It possesses over 750 locomotives, about 700 cars, and over 32,300 freight cars. The Central Pacific Railway now forms part of the Southern Pacific system, which, lying wholly in the western states, operates nearly 8,800 miles of track. On the Southern Pacific system there are more than 1,480 locomotives 1,690 passenger cars, and over 52,000 freight and other cars, including some 4,000 devoted to special services. THE “DAYLIGHT” EXPRESS, on the Southern Pacific’s line, is one of the chief trains on that system. It links San Francisco and Los Angeles, a distance of 471 miles by the route taken. This train includes an observation car with a large open-air platform, a lounge car, and a restaurant car. Its coaches are painted pearl-grey. Another large system is the Atchison, Topeka and Santa Fe, which constitutes one of the principal links between Chicago and the coasts of the Southern Pacific and the Mexican Gulf. There are over 9,500 miles of track, and it is over the lines of this company that the famous express the Santa Fe “Chief” makes its daily journey. This train is illustrated and described in the chapter beginning on page 281. In the Southern States is the Atlantic Coast Line Railroad, with over 5,100 miles of track, 840 locomotives, over 500 cars and some 31,000 freight wagons of all descriptions. An important railway in the Eastern States that serves the coal-fields of West Virginia and Kentucky is the Chesapeake and Ohio, which also provides a direct route from Chicago, Toledo, and Louisville to the Atlantic coast and to Washington. This line comprises over 3,100 miles of track, over 1,000 locomotives, and more than 60,000 freight and passenger cars. The line also owns five steamships, and a number of lighters for the transport of freight. Another railway leading out from Chicago is the Chicago and North Western line, with over 8,470 miles of track, 1,678 locomotives, three Diesel electric locomotives, nearly 2,000 passenger cars, including a number driven on the petrol-electric system, together with over 60,000 freight and other cars of all types. Another important line also leading out from Chicago is the Chicago, Burlington and Quincy Railroad. It is over the lines of this railway that the famous American train the “Zephyr” operates, and a reference is made to this in the chapter “Speed Trains of North America”, which, begins on page 1037. 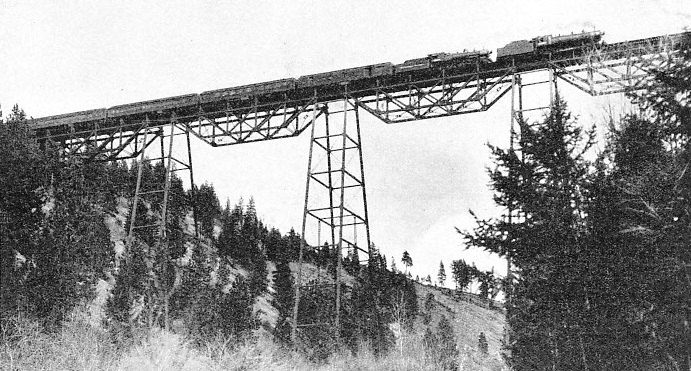 THE “NORTH COAST LIMITED”, a transcontinental express, crossing the Marent Viaduct, west of Missoula, Montana. The train operates over the metals of the Chicago, Burlington and Quincy Railroad, the Northern Pacific Railway, and the Spokane, Portland and Seattle Railway. It links Chicago with cities in North-Western America. One of the most remarkable lines in the United States of America is the Chicago, Milwaukee, St. Paul and Pacific, on which operate some of the largest electric locomotives in the world. Of the 10,400 miles of track over 660 route miles through the Rocky Mountains have been electrified, and the traffic is dealt with by sixty-two giant electric locomotives. In addition to these there are more than 1,250 steam locomotives. There are over 1,000 passenger cars and 64,000 freight and other cars. The continent of North America has presented to the railway builder some of the greatest difficulties encountered by man in his conquest of nature and the spanning of immense distances. The linking of the Atlantic coast of the United States with the Pacific seaboard had been in men’s minds from the early days of the nineteenth century, and in 1844 a wealthy American, Asa Whitney, vigorously attacked the whole problem. Whitney devoted all his energy and resources to arousing public interest in the construction of a railway across the Northern States from coast to coast. Unfortunately the whole of Whitney’s fortune was absorbed in these efforts, and it is said that he spent the rest of his days working as a milkman. Whitney’s work had, however, borne fruit, and a brilliant engineer, Edwin F. Johnson, was so fired by the former’s enthusiasm that he ultimately persuaded the Government to sanction surveys for the enterprise. The Pacific Railway surveys proved a momentous undertaking, and five expeditions were dispatched to .the coast to find the easiest route for the railway over the Rocky Mountains. The reports compiled by these pioneers, summarized in thirteen volumes, were submitted to the Government in 1855. In 1862, after considerable academic discussion had been expended on the reports, the State of California demanded railway communication with the Eastern States. The Government, on California’s threat to secede from the Union, sanctioned the building of the Union Pacific and Central Pacific railways, as related earlier in this chapter. This decision was at the expense of the northern scheme propounded by Whitney and Johnson, and so uncompromising was the latter in his attitude that the Government agreed to the building of a Northern Pacific Railroad. The Act of Congress authorizing the line was signed by President Lincoln on July 2, 1864, two years after the Act creating the Union Pacific Railroad. Under Johnson’s leadership the necessary surveys were made and the route decided upon. The American Civil War, how-ever, presented a serious obstacle, as no financial backing could be obtained to carry on construction. During the war, an obscure banking house - Jay Cooke and Company of Philadelphia - sold some £266,000,000 of Government securities. The Northern Pacific Railway urged this concern to assist it in obtaining funds in a similar manner. The bank sent independent engineers through the West to investigate the position. The engineers’ reports proved satisfactory, and the banking company embarked on an extensive campaign to advertise the project and to obtain public financial support. ON THE SOUTHERN PACIFIC SYSTEM. Oakland Pier Terminal, in California, looking west across San Francisco Bay towards the city of San Francisco. There is a train ferry across the bay operated by the railway company, and the berth can-be seen on the extreme left of this illustration. It was by no means an easy task to persuade investors to subscribe to the funds of the railway, as the prospects of profitable working seemed, at that time, somewhat remote. In 1870, the territory in which the new railway was to be built, had a population of only 600,000. Of these, some 400,000 were in the State of Minnesota, and the remainder were scattered in small communities throughout the other states along the route, sharing the land with the Indians and the buffalo herds. It is not surprising that critics were in doubt as to the source from which the railway was to derive its traffic. Supported, however, by the funds raised, the railway builders began work, and from a point twenty miles wrest of Duluth in Minnesota, the track was pushed forward to the Pacific. By the end of 1870 the railway had been laid as far as the Red River in Minnesota. Simultaneously with the drive to the Pacific, a start had been made in the far west to build a line running eastward to meet the railway from Minnesota. The western portion was started at the Columbia River, near Portland (Oregon). Work progressed steadily, the prairies were crossed as far as Bismarck, on the Missouri River, and the eastbound line from Portland reached Tacoma. Then the great financial crash of 1873 hit the United States and the railway was caught at a disadvantage. The statements circulated by Jay Cooke and Co. were subjected to considerable adverse criticism, and panic-stricken investors sent experts to report on the partly finished railway and its possibilities. Unfortunately the shareholders’ representatives were prejudiced from the outset, and as they were unable to appreciate the vast possibilities of what is now the Middle West - the backbone of the United States of America - their reports brought about a financial landslide resulting in the railway’s bankruptcy. The five years 1870-5 had not, however, been wasted. Over 550 miles of track had been laid and forty-eight locomotives, together with more than 1,200 freight wagons, had been put into service. In addition to railway development, great prog-ress had been made in agricultural expansion. Not one bushel of grain was taken off the land in the railway zone during 1870, but in 1875 the harvest totalled half a million bushels. After the financial crisis constructional work practically ceased, but the line was kept in thorough repair and showed a steady increase in revenue. Large numbers of settlers were attracted to the country served by the railway, and cultivation was put on a firm basis. The land that had been regarded as desert proved to be wonderful wheat country; but another popular fallacy proved a stumbling-block in the path of agricultural expansion. This was the impression generally held that the prairie was something to be dreaded. The icy blasts from the North swept clear over level country for hundreds of miles. Heavy snowfalls were driven by the wind into huge banks - forty feet and more in depth. Such conditions have always held and must endure for all time, but man’s conquest of the North American winter ranks in the forefront of human endeavour. In the early days of the Northern Pacific Railway, however, it was deemed advisable to run before the storm, rather than to stand and endure the rigours of the winter. United States troops, holding in check the remaining Indians on the prairie, increased the fears of the settlers with highly-coloured tales of the blizzards, the low temperatures, and the hardships of the long winter. Most of the farming community, after the gathering of the harvest, locked the doors of their shacks and departed to the towns for the winter, returning to their farms in the spring. The general belief that the winter-bound country was untenable spread to the railway, and with the loading into trucks of the last of the season’s grain, all locomotives, wagons, and men on the prairie were withdrawn. The company was of the opinion that it was better to close down the railway for five months or so each year, rather than face the fury of the winter. 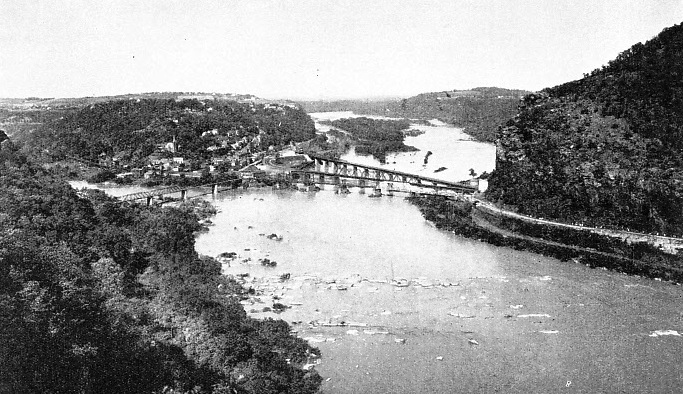 RAILWAY BRIDGES at Harper’s Ferry, West Virginia. Harper’s Ferry is the meeting point of three states, Maryland, Virginia, and West Virginia, and of two rivers, the Potomac and Shenandoah. The locality is served by the lines of the Baltimore and Ohio Railroad. The railway’s policy met with a dramatic reversal in 1876, when the settlers were faced with a peril greater than that of the winter storms. This was the rebellion of the Sioux Indians. The United States Government decided on drastic military action, with Bismarck, on the banks of the Missouri, as the base. To ensure the necessary supplies, the railway company was induced to keep the line open during the winter of 1876-7. Traffic proved to be considerable, but, despite exceptionally fierce weather, with terrible blizzards and heavy falls of snow, no difficulty was experienced in maintaining communications. In 1879 the railway’s financial position had improved and construction was resumed. On the eastern section of the line the track had to be carried over the Mississippi, necessitating the construction of a great bridge. This immense structure, 1,400 ft long, is divided into three spans with the railway track carried 50 ft above the water, and cost £200,000. After crossing the river, construction became easier, and the building of the railway proceeded apace across the plains of Dakota and Montana as far as the foothills of the Rocky Mountains. On the western section work was necessarily carried on at a slower pace, as the range of the Cascade Mountains constit-uted a formidable barrier. Huge rifts in the mountains had to be spanned by massive timber trestle bridges, for which millions of feet of lumber were cut in the vicinity of the line. Mountain streams also were bridged by great timber structures, and these pioneer methods proved most successful in reducing the high cost of construction. Ledges were cut in the mountain sides to accommodate the track, and tunnelling was reduced to a minimum, although it could not be avoided entirely. One of the most spectacular displays of engineering on the railway was the driving of a tunnel nearly two miles long beneath the Stampede Pass over the Cascade Mountain. Two tunnels also were necessary through the range of the Rocky Mountains, the Bozemann Tunnel, 3,160 ft. long, and the Mullan Tunnel, with a length of 3,847 ft. Simultaneously with the construction of the main line from the eastern and western ends respectively, short branches were laid in promising districts for mining, lumbering, and agricultural development. Control of the Northern Pacific Railway was at that time in the hands of Henry Villard, one of the most remarkable characters in the history of the United States of America. Villard was born at Speyer, Germany, in 1835, and was the son of a Bavarian judge. In 1853 he went to America, where he learned English and became a journalist. He was a war correspondent during the Civil War. After many years of newspaper work, both in Europe and America, Villard turned his attention to railway finance and organization. He became President of the Northern Pacific Company in 1881, and immediately directed his energies to speeding the completion of the northern transcontinental route. On September 8, 1883. the eastern and western branches of the railway met at Gold Creek, in Hellgate Canyon, Montana, thus bringing into operation some 2,260 miles of line. One of the most important works undertaken during the construction of the Northern Pacific was the Stampede Tunnel through the Cascade Mountains. To-day the Northern Pacific Railway ranks among the foremost of the United States main lines. It has a mileage of 6,736, all on the standard gauge of 4 ft. 8½-in, and owns nearly 1,000 locomotives, over 1,400 cars, and nearly 49,000 freight cars. One of the earliest railways to be built in the interior of the United States was the Illinois Central Railroad, which was formed in February, 1851, by the General Assembly of Illinois. Two and a half million acres of public land had been granted to the State by Congress in 1850 for the construction of a railroad from the southern terminus of the Illinois and Michigan Canal to a point near the junction of the Ohio and Mississippi Rivers, with a branch to Chicago and another to Dubuque, near the state of Iowa. The Illinois Central was, therefore, the first of the land grant railroads, and the system was subsequently adopted by other lines, notably the Union and Central Pacific Companies. The Illinois Central now operates over 6,850 miles of track, of which 155 miles have been electrified. There are over 1,750 locomotives, nearly 1,900 passenger cars, and about 62,500 freight cars. A MODERN EXPRESS on the Illinois Central System. This picture shows the “Louisiana”, a daily train between Chicago and New Orleans. The system handles some 1,750 locomotives, 1,860 coaches, and 62,500 freight wagons. You can read more on “The Atchison Topeka & Santa Fe Railway”, “Giant American Locomotives”, “The Pennsylvania Railroad”, “Speed Trains of North America” and “The Union Pacific Railway” on this website.